The Content Seller is a very powerful feature, it allows you to convert any content to a product! you can use the content seller shortcode to limit the ability to access any content type for buyers only, logged in users only or depending on the users role. Also, the Content Seller allow you to convert other plugins functionality and features to products! for example one of the Forms Management System features is to allow the users to publish posts from the frontend you can use the Content Seller to force the user to pay in order to publish the posts. Using the content seller is pretty easy and straightforward all you should do is to just wrap your content with the Content Seller shortcode. For example, I’ll assume that you are an Author and you want to limit half of one of your articles just for the users that have Author role. Now create a new product like explained here. 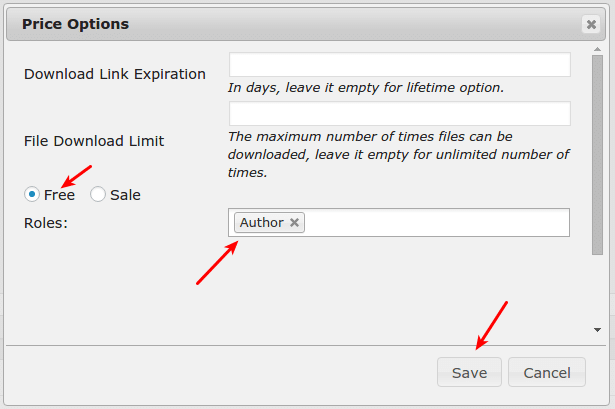 Click on “Free” and select the Author role from the “Roles” field and click on “Save” button. Now only the users that have Author role can access this part(“This content should be limiting access for only the Author role users” in our example) of your article. product_id: is the product id(check FAQs page for more information). product_sub_id is the product sub id or price id ( check FAQs page for more information). license_message is the message that the other users whom can’t access the content will see. expiration_message when the user’s subscription expired the user will see this message. You can so easily with the content seller meta box restrict the access of the post content(body) for any post type for only buyers of specific products.